Wednesday, 5:30am. Rose wakes up and makes breakfast for her two young children. Rushing out the door, she walks an hour to work in the rain as she can’t afford the bus fare. And there she sits crouching at the bench, sewing seams for garments at 6p an hour. The men at the factory earn 8p and upwards. After ten hours work, her fingers ache and her head throbs from the noise of the machines. At home after cooking tea, ironing, and seeing her daughters to bed, she finally hits the pillow at 11:30pm, exhausted by the drudgery of the day. Rose lived in inner city London in the 1970s. Her story is emblematic of women’s lives across the UK. The Equal Pay Act was introduced in 1970, with the intention of women and men to be paid equal wages. In reality, though, women endured more years of discrimination and inequality. 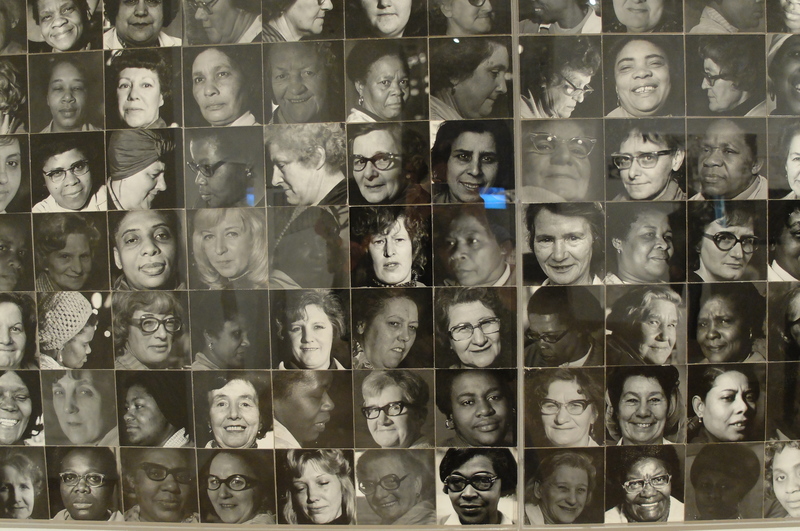 I visited the exhibition Women and Work at the Tate Modern, which uncovered the lives of these invisible women in our country. I was struck by the account of Jean, a factory worker who smuggled bread into her stockings. Jean felt hungry and couldn’t wait until lunch to eat, so she took a bite- but she was caught and fired on the spot. Mary, another woman at the same factory, was found in tears because her weekly wages were docked for no reason, meaning she wouldn’t have enough money to pay her rent. With the help of the union representative, it turned out this was a ‘mistake’ which was corrected. It’s shocking to think just two generations ago, women in this county- maybe your mother or grandmother- were trampled on in like this every day. Would you put up with it? The demand for cheap labour didn’t stop there, and it was women who paid the price. Factory owners reacted quickly to the Equal Pay Act, downgrading people’s jobs and forcing women to work from their homes. Homeworkers (Margaret Harrison, 1977) testifies to the real lives of women in the UK who were paid poverty wages for brands like Debenhams and Dorothy Perkins. Ordinary women, desperate for work, had no choice but to work at home without legal rights or protection. They became invisible. Their hands were swollen and painful but they couldn’t afford to take time off sick. They got into debt when companies didn’t pay them their wages. They knew they were being exploited, but all the while they kept working and fighting for their children to have a better life. Today, 40 years later, it is women in Asia who are the homeworkers. The effect of globalisation means that the world’s poorest and most disadvantaged women are now fighting this battle. 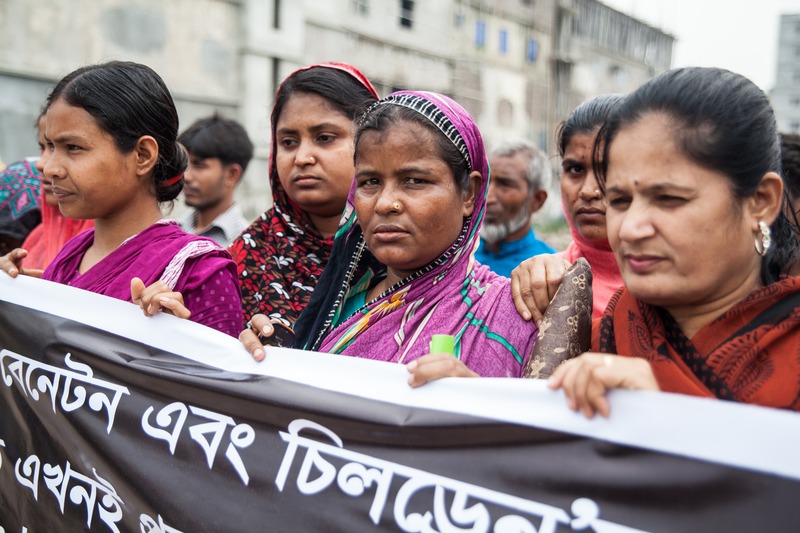 Supply chains have changed dramatically, but the back-breaking exploitation and discrimination of working women remains. In fact, it’s become much worse. 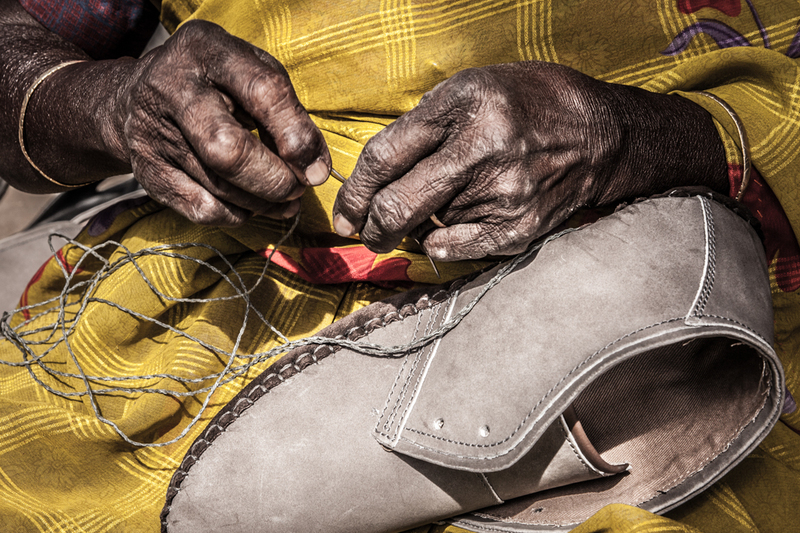 In Ambur, a dry, dusty town in south India, many Dalit and Muslim women earn a living by stitching uppers on shoes. In the report Stitching Our Shoes- Homeworkers in South India, we found women are paid around 6 rupees a piece. This is about 96 rupees (£1) a day- well below the poverty line. These shoes are sold for between £40 and £100 on our high streets. Workers are provided with the thread to stich the uppers, but they have to buy their own needles, trapping them into a cycle of debt. They suffer from pain in their back, neck and shoulders, and often have problems with their eyesight and chronic headaches. But these women are not powerless. There are signs that they are beginning to fight back. In the villages surrounding Ambur, small groups of women have started to associate and advocate for better pay. It’s early days, and there is resistance from the powerful intermediaries and some of the workers who are afraid to put themselves forward. We can show our solidarity by demanding that retailers recognise homeworkers in their supply chains. I know there is hope that these women will fight for the rights and dignity they deserve. I am struck by how the lives of these ordinary women from London and India- Rose, Jean and Mary; Sumitra, Runa and Shanti; are threaded together by shared experiences. Drudgery. Monotony. Broken dreams. But they believe they are better than this. Joining together is a surely the way they can protect and keep themselves strong. Is the sunshine and beauty of nature only made for the fortunate few, or for all humanity to share?” This was published in Women’s Industrial News in London in 1914, but it echoes true today. All workers, women and men, deserve to earn a living with dignity. We won’t give up the fight. “Yes, it is bread we fight for- but we fight for roses too! Long Hours Versus Efficiency by Miss Cave for the Industrial Sectional Committee in the Women’s Industrial News, 1914. 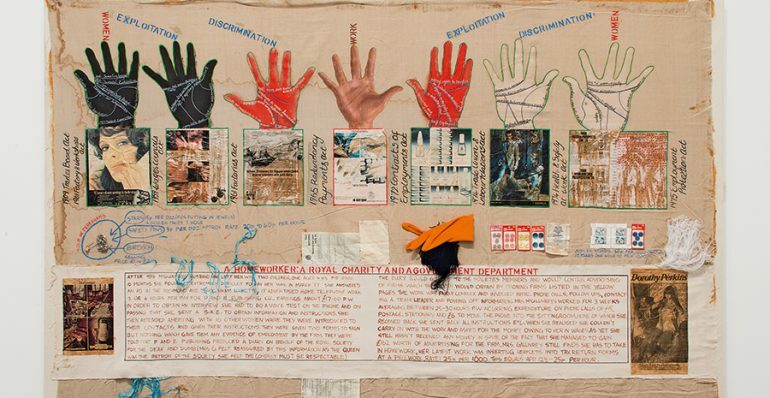 Women and Work: A Document on the Division of Labour in Industry by Margaret Harrison, Kay Hunt, Mary Kelly 1973-75, an exhibition at the Tate Modern. 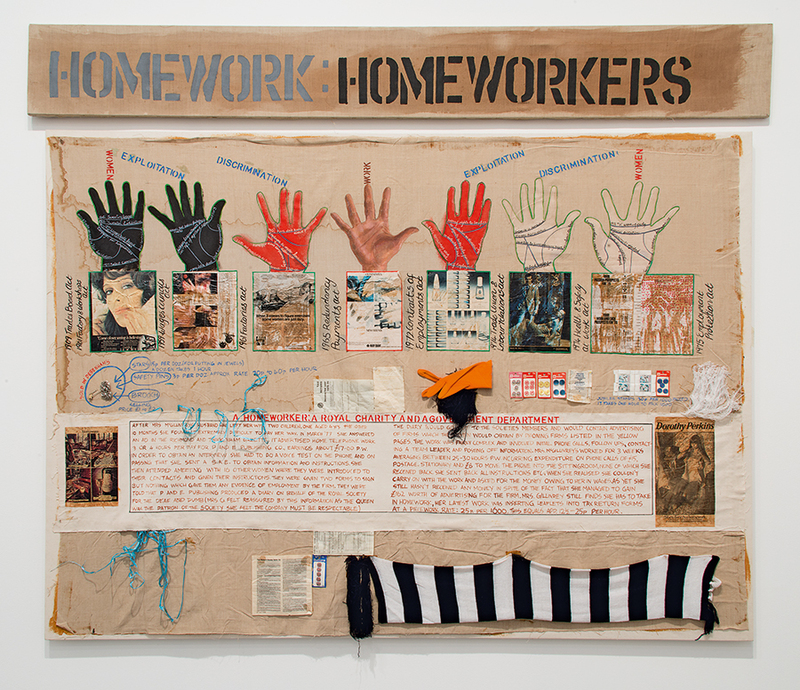 Homeworkers by Margaret Harrison 1977, an exhibition at the Tate Modern. Stitching Our Shoes- Homeworkers in South India a joint report by Homeworkers Worldwide, Labour Behind the Label and Cividep, March 2016. Bread and Roses by James Oppenheim, 1911.